Midwest, I am back home! If you followed me on Instagram Stories last week (@colormesassy), you saw how much fun I had on our family vacation at Hilton Head, SC. It has always been a dream of mine to visit the Island and am so grateful we were able to go there. We started our trip on a Saturday. We flew into Charleston’s airport and drove two hours to Hilton Head Island. I was completely surprised by how much green I saw. The highways were so different from ours in the Midwest. We drove through tunnels and tunnels of trees and it was gorgeous! The commute to get to our final destination was a little tiring: two flights plus 2 hours drive, but it was worth it. We stayed at an oceanfront condo in Palmetto Dunes called Villamare. The condo was rented through VRBO (Vacation Rental by Owner). It was so relaxing to wake up every morning with the sound of the ocean and the bright sun shining through our big windows. If you know me, you know how much I miss the beach and warm days of Summer. This trip was what we all needed: a relaxing and stress-free time. Our days consisted of going to the beach and letting Rapha play with the sand, beach walks, pool time, exploring the shopping area and restaurants. The Salty Dog Cafe – We had a great dining experience at the Salty Dog Cafe. Even though I was craving a burger that day, everybody else in our table ordered some kind of fish or the Seafood Pot Pie. My husband ordered the pot pie and it was fabulous and huge. If you like pot pies, this pie is a must try! The Salty Dog Ice Cream – The Salty Dog Ice Cream is right next to the Salty Dog Cafe. If you like ice cream you must try their homemade ice cream. I would encourage you to taste their key lime pie ice cream. That was one of the most delicious ice creams I’ve ever had. Note: you have to pay $6 dollars per car to enter that area which is called Sea Pines. There are also lots of cute shops in between the restaurants. Skull Creek Boathouse – This is a must go restaurant! Skull Creek Boathouse is a very famous restaurant on the Island. On the weekends they have live music on the deck and I encourage you to get there early to get a table. Most restaurants there don’t accept reservations so keep that in mind before you head out to dinner. Pretty much every restaurant there serves the famous “hushpuppies” (deep-fried cornbread balls) and Skull Creek had the best ones. This picture doesn’t make justice of how cool the patio looks. Old Oyster Factory – Taste of southern charm, that’s how I would describe Old Oyster Factory. Dressier than the other restaurants listed, this 4 1/2 star restaurant has great service and delicious food. Their grouper and triggerfish were absolutely amazing. The Crazy Crab – The Crazy Crab restaurant was another great restaurant. I don’t eat crab but, my sister-in-law raved how wonderful their crab legs were. Frosty Frog Cafe – If you want something simple to eat, like pizza or a burger, Frosty Frog Cafe is just what you need. This restaurant is located at Coligny Plaza, so you can shop after you have a bite to eat. Frozen Moo – Another great place for ice cream is Frozen Moo. They offer 92 flavors of ice cream! This place is also located at Coligny Plaza. Southern Coney & Breakfast – On our last day in Hilton Head we had breakfast at Southern Coney and I have to tell you…their pancakes were very fluffy and absolutely delicious. They also have mouth-watering cheesy biscuit sandwiches. This is a must go diner for breakfast. Big Jim’s BBQ – I wouldn’t go back to Big Jim’s BBQ unless they change their food. We had lunch there one day and it was terrible. I had a pork quesadilla that was tasteless and my hubby had the beef brisket with pulled pork and it was dry and terrible as well. There’s shopping everywhere on the Island. I personally love little boutiques with different and unique clothing. One of my favorites was called Coastal Bliss located in the Shelter Cover Town Centre. 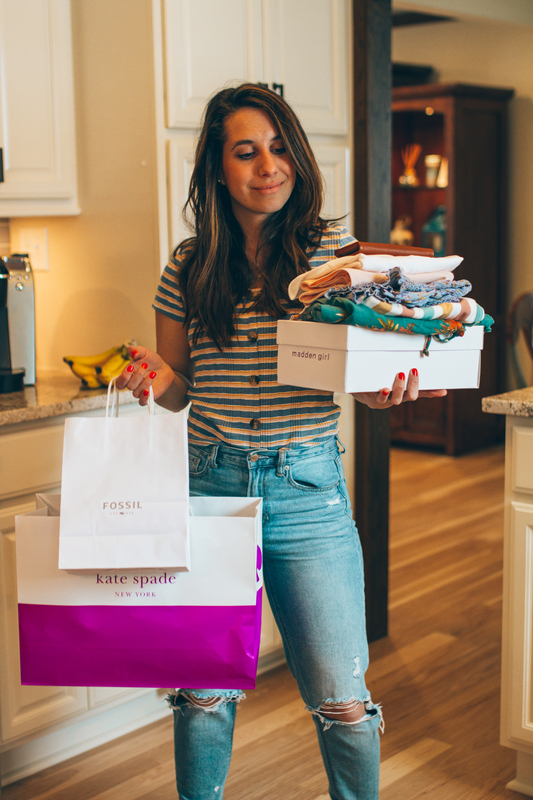 There is also a Tanger outlet mall if you want to spend the day shopping at big stores like Pandora, Polo, and White House Black Market. I love to shop but I didn’t do too much shopping this trip. All I wanted to do was relax… and eat ice cream, obviously. Note: I wouldn’t swim in the ocean because of sharks. My husband saw two fishermen catch a baby bull shark right on the shore. You also have to be careful with crocodiles. We were cautious not to get close to the rivers and luckily we didn’t see any, but warning signs are everywhere! We mainly stayed on the Island but we went to Savannah, GA for the day and on our last day we went to Charleston’s for a few hours before we had to head to the airport. From Hilton Head to Savannah, GA is only a 50-minute drive. Since the city is full of history we decided to to a trolley tour around the city. I recommend doing a tour if you plan on spending a day or more in the city. This is the best way to thoroughly understand Savannah’s amazing history. After the tour, we went out to dinner at one of Savannah’s most iconic and highly rated restaurants: The Olde Pink House. This house was built in 1771 and it’s one of Savannah’s most important early cotton factors and founding-family members. If you want to have dinner there you have to make a reservation days prior to your visit. We were able to get seated in the basement dining area only because we waited at the bar 40 minutes before the dining room opened. Our last day in South Carolina, we spent in Charleston. We actually only spent a few hours before we head over to the airport. In Charleston, we walked around City Market wich consists in 3 blocks of vendors and artists selling jewelry, clothes, art and more! Really cool place to visit. I wish we had more time in Charleston because the city is full of attractions and things to do. 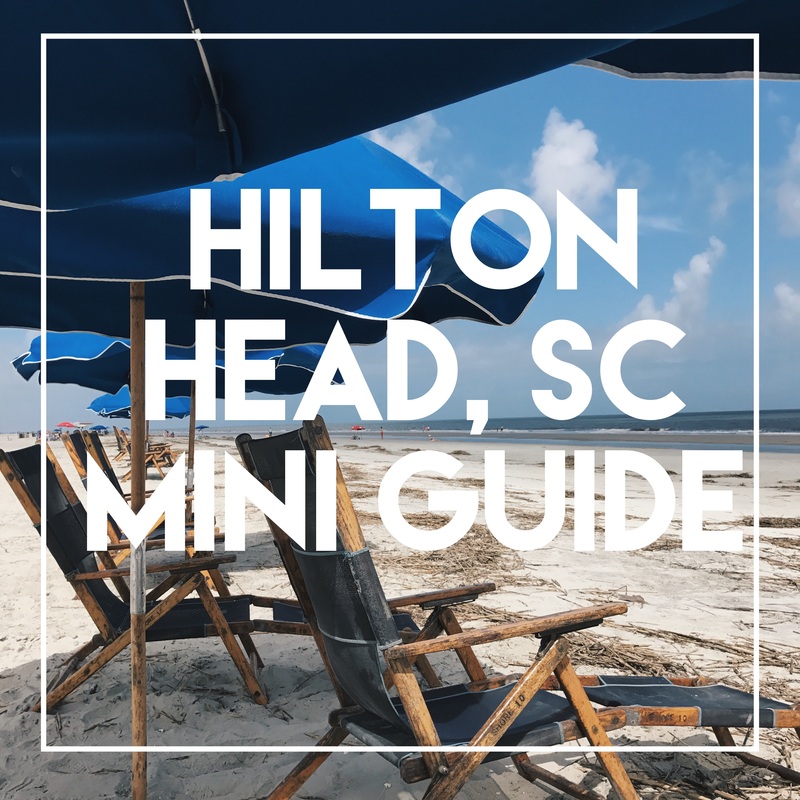 I hope you guys enjoyed my mini guide to Hilton Head. Hands down one of my new favorite places to go, relax, and have a great time! If you guys have any questions don’t resitate and send me an email or a message below. Oh my gosh, this place sounds like a dream. I would so love to go to a place like this. Looks like its really kid friendly…my kids would love it there.